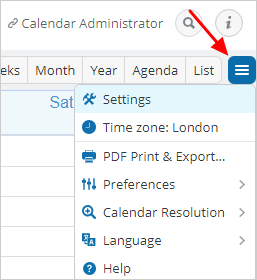 The Settings in a Teamup Calendar allow calendar administrators to create and maintain sub-calendars and manage access links through an easy-to-use, web-based interface. This is the recommended way to configure the calendar. In some exceptional use cases, administrators need to create a very large number of sub-calendars or access links. 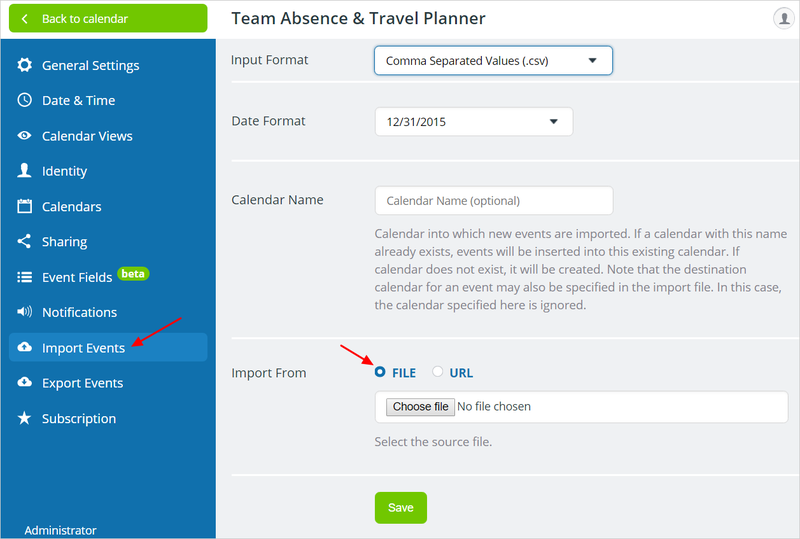 For these cases, Teamup offers the option to import sub-calendars and access links from CSV files. This process requires some familiarity working with the CSV file format. Open the calendar Settings and select Import Events. Select input format to be Comma Separated Values (.csv). Select File to import. The required formats are described below. The import tool looks at the format of the file and determines if events, sub-calendars, or calendar links are to be imported. Click Save to start the import process. This section explains the format required to import sub-calendars from a CSV file. Line 1 is a header line and defines all the columns of this file: Calendar Name, Color Id, and Allow Overlap. The header line must be present in the file exactly as shown in the above example. Each additional line below the header line defines a sub-calendar. The following table defines the supported field names and the format of the field values. Calendar Name Yes Name of the sub-calendar. Up to 100 characters. Color Id Yes ID of color assigned to sub-calendar. All supported colors are defined in the API documentation. Allow Overlap No Supported values are true or false. This defines if the sub-calendar allows overlapping events or not. This section explains the format required to import calendar access links from a CSV file. Sarah, , selected, "Conf. Room Newton=1, Conf. Room Thales=2"
Line 1 is a header line and defines all the columns of this file. This line must be present in the file exactly as shown in the example above. Each additional line below the header line defines a calendar link. Link Name Yes Name of link. Up to 100 characters. Password No A password is optional. If a value is provided for this field, a password check is activated for this link. Calendars Shared Yes This field defines if all or only selected sub-calendars are accessible through this link. Supported values are all and selected. Permissions Yes The value of the permission field depends on how field Calendars Shared is configured. Let’s have a closer look at the example file given above. Line 1 is a header line and must be copied as shown above. On line 3, a link named “Reception” is assigned modify permission to all sub-calendars. On line 4, a link named “Sarah” is assigned modify permission to sub-calendar “Conf. Room Newton” and read-only permission to sub-calendar “Conf. Room Thales”. On line 5, a link named “Frank” is assigned modify permission to sub-calendar “Auditorium”.